The period between the publication in 1957 of the liberalising Wolfenden Report and the introduction in 1987 of the homophobic Section 28 was characterised by unprecedented optimism and political activism among lesbians and gay men in Britain. 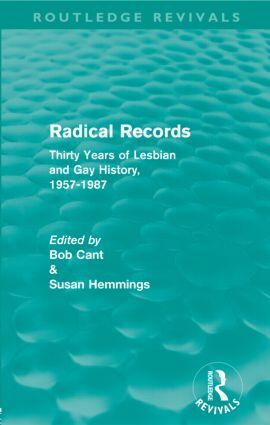 But the law and its shortcomings never determined their whole political and cultural agenda and Radical Records explores the diverse and sometimes conflicting attempts of lesbian and gay people to build a new world for themselves and those they loved. The contributors recount their own personal narratives of how they struggled to re-define their identities, to explore non-traditional expressions of intimacy, to reclaim public spaces, to engage with the HIV epidemic, to build alliances and, generally, to make radical transformations of their lives. The re-issue of this important work, first published in 1988, gives its readers an opportunity to re-visit that turbulent time through the voices of its participants.